So here I am again, a day late and a dollar short. I tried to get on my computer yesterday to do Week In Review and the computer was having none of it! Not sure why. Both of my computer experts are out of reach at the moment so I’m going to have to do it long distance. We’ll work it out. So in spite of the fact that I am a day late, I’m still here and I’m still going to link up with Meghan’s Week In Review. Be sure to check out the other reviewers over at her bloggity blog Clean Eats, Fast Feets! Another one of those crazy weeks where things go round and round and I feel as if I’m going to spin-off of the carousel. I’m working at getting that back on track and I’m holding on to my horsey as tightly as I can. We’ll get through it all, I have faith in that and I know all will be well. I know that Meghan is going old school, back to lists this week. I’m working on lists but won’t be able to share them until next week, well because they’re not on paper yet, still in my head! It’s a scary place in there, but I have the treasure map and I’m safe as long as I don’t step on a butterfly. ( Sci-Fi movie reference, anybody? Anybody?) Trust me…there will be lists next week. I am enjoying working on The Artist’s Way process. I talked about it last Friday. I’m feeling comfortable with the idea of trying to dig out my creativity that’s hidden in there somewhere. I should have done this a long time ago, but I’m a firm believer in the fact that things will come in their time. I like writing the morning pages and haven’t missed a day yet. Hope to keep up that track record. I like the idea of unloading all the excess nonsense that’s up in my head. Get it out of the way first thing in the morning and I can try to be productive the rest of the day. I like it. I’ll keep you all posted on how I’m doing. The other thing that I’ve been doing is something I saw online. I know not to believe or mindlessly follow everything I see on the Interwebs, but this is a good idea and not hard to follow and there will be a benefit at the end. This is my little money jar. I wish I had saved the piece that I saw online. It was a little grid showing how it works, but it’s pretty simple and I think even I can do the math, well not right now and not without a calculator…but I could do it!! The first week of the year you put $1 in a jar (or envelope or secret drawer or hat band or whatever you like.) On the second week you put in $2. I’m up to week three so on Monday I put in $3. 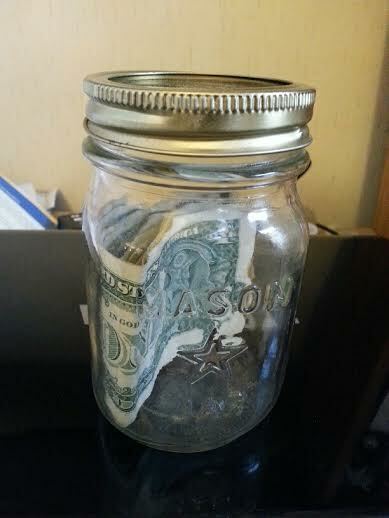 I’m up to $6 in my wonderful old Mason jar. I’ve put a reminder on the calendar on my phone so I won’t miss a week. You do this every week the number of dollars you put in corresponding to the week of the year. The last week you put in $52. The grid said that you’d wind up with just over $1300 at the end. If it’s hard for you to save money, as it is for me sometimes, this is a good idea. Making it like a game makes it fun and I’ll end up with a lot of money at the end. No pyramid schemes, just saving. At the end of the year I’ll be sitting in New Mexico and opening my jar filled with money. I like that. (How’s that for creative visualization you creative visualization folks out there?!?!) Money is good. New Mexico is even better. Together, they are the best! My week included a disappointing visit to Weight Watchers on Saturday. I was up 1.6 pounds. I know I haven’t been doing what I’m supposed to and there has been LOTS of mindless, emotional eating going on. After that realization on Saturday, I have been Much better. I’m feeling back in control and after almost 27 years working on this program, I’m actually starting to plan my meals in advance. It’s been a big help for the last few days and I’ll talk more about it next week after I see how it’s worked out. So, that’s Week In Review, a little late, but here nonetheless. Be sure to stop over at Clean Eats, Fast Feets to see what Meghan and the other kids have on their lists. It’s always great fun! Thanks, Sarah! That’s so funny. I’m working hard to get back on track here in blog land. Hope all is well with you. Have a great day! Hi Fran, fun to catch up! I’ve been bad at keeping up with blogs lately. I can’t wait to read about what you do in New Mexico with all of your money at the end of the year! Have a great weekend! Thanks, Stacie! I always enjoy your comments. You’re so funny. I can’t wait to see what i do with all of that money either!! Have a great day! The money jar is a great idea and absolutely counts on the visualize yourself spectrum. Life is cyclical so even though things may seem topsy turvy right now, they’ll right themselves in the end. Hang in there, and great job on the morning pages. You are such a wonderful support, Meghan. I truly appreciate it. Too bad you live in Cleveland!! Hugs!